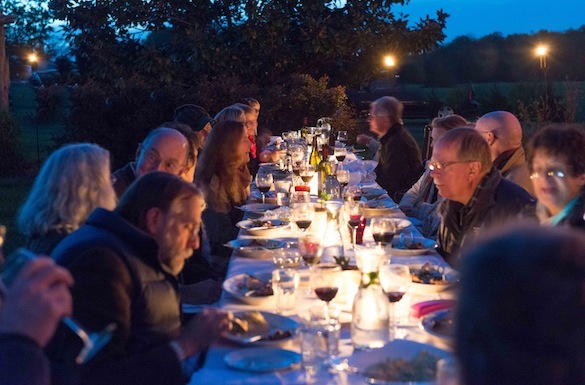 Planning outdoor dining events can be a bit stressful, especially when they include many chefs, several food purveyors, farmers, winemakers, and guests that have traveled long distances to experience something very special. Add to the mix the coordination of a number of venues in different cities and this year’s unpredictable weather and you have a situation that requires a lot of backup planning. In mid-April, the week prior to our On The Road culinary adventure to Jefferson’s Virginia, Mother Nature decided to give us one last blast of winter bringing snow and frightfully cold weather to Virginia. 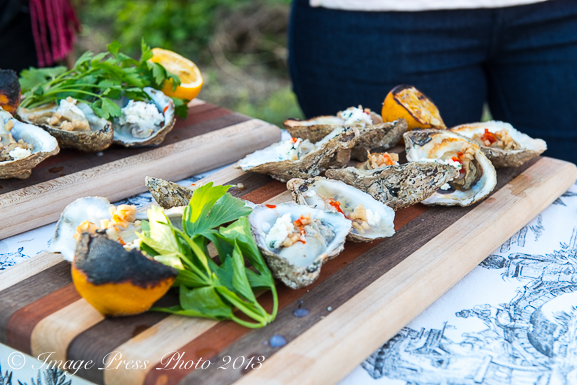 We were relying on beautiful freshly picked local produce harvested from several farms for our meals, so days shy of the event, we still weren’t quite sure how everything was going to turn out. At this point, springtime was at least three weeks behind schedule making for a tense situation. Frequent updates from everyone involved helped to calm the anxiousness around the event. Days before we were to arrive, the sun smiled brightly and brought temperatures to a staggering 90 degrees in Richmond. The fertile soils of Virginia began to burst with life. The grasses greened up, flowers sprouted, and yes, there was even produce to harvest. 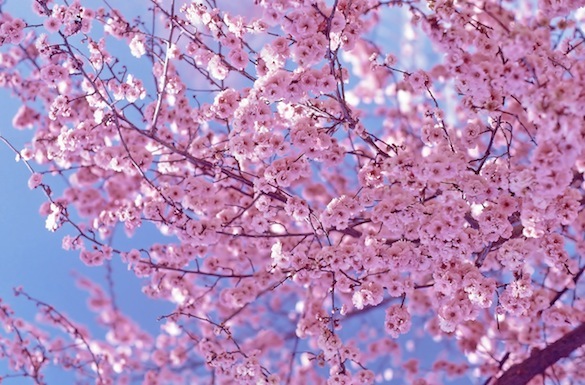 To make it complete, the Cherry Blossoms were in full bloom. Our timing was both extraordinarily lucky and perfect. Springtime in Virginia was everything we had hoped it would be. 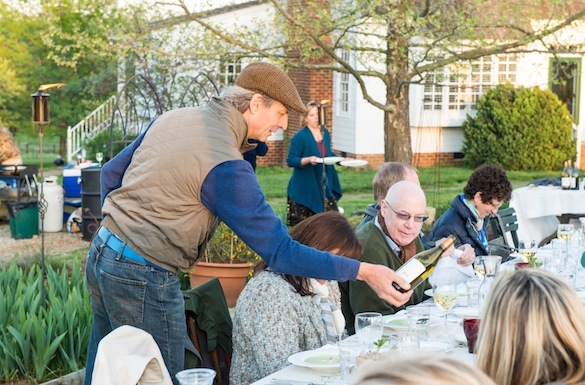 From our first evening’s farm dinner at Manakintowne Specialty Growers, to our luncheon in the orchard at Monticello, followed by the fine dining experience at Lemaire, and our visit to Olli Salumeria, our expectations were even exceeded. When I plan these events, I start with a specific vision and theme. What I had pictured for our guests could not have been executed more beautifully by the many people involved. 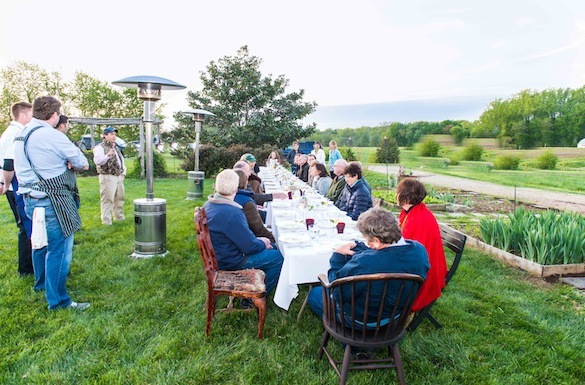 When we arrived at Manakintowne for our tour and farm dinner Sunday evening, a gorgeous farm located a half hour outside of Richmond, the sun was brilliant in the sky and brought a comforting warmth to the slight chill in the air. 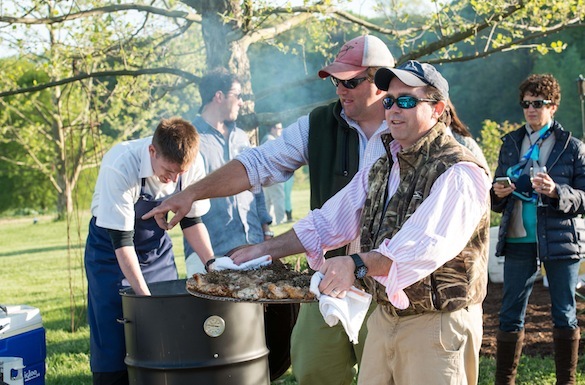 As our guests began to arrive, the chefs, winemaker, and purveyors who had come from as far as the Eastern Shore of Virginia and the foothills of the Blue Ridge mountains in Charlottesville, were busy prepping for the dinner. As the sun set on the farm, we enjoyed a Sauvignon Blanc from Barboursville Vineyards, selected to pair with the menu by winemaker Luca Paschina. It went perfectly with the briny roasted oysters and steamed clams with drawn butter brought over fresh that morning by Tom Gallivan of Shooting Point Oysters. Several neighboring farmers and friends of Rob and Jo Pendergraph of Manakintowne gathered with us for the evening contributing their own produce, like fresh asparagus, for our dinner. Billy Fallen of Billy Bread fame also brought his legendary bread to enjoy with our meal. Executive Chef Walter Bundy of Lemaire and his sous chef, Patrick Willis, were joined by Lee Gregory of The Roosevelt and Aaron Cross from Fossett’s to create and prepare a truly memorable dinner. 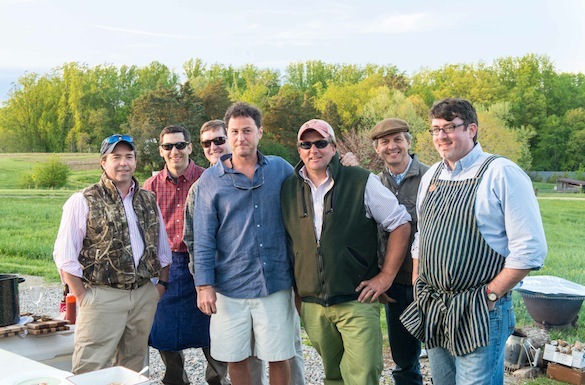 Several courses included: a beautiful hand picked salad harvested that day from Manakintowne Specialty Growers; seasonal Soft Shell Crabs with a Ramp Salsa Verde; and a a dish of creamy Anson Mills Slow Roasted Polenta with Spring Asparagus, Manakintowne Leeks, and Sauteed Spinach. Dinner was served family style paired with several Barboursville wines. As the stars filled the sky and the temperature began to fall, we moved into the farmhouse for dessert and coffee. The Pendergraph’s home and farm provided a beautiful setting for our first event on this culinary adventure. This is a really super posting. You have brought the dinners and settings to life – the photos are superb. Thank you. Thank you so much, Lynn. It was such an inspiring trip and I’m so glad that it comes through in Mr. B’s photos. We want to go! (I was born in Charlottesville). We hope you will join us on a trip soon. We’ll keep you posted for 2014! It is possible that we may do this tour again. Amazing!! Gwen, this was even more fabulous than I ever imagined when you announced the culinary tour. What fabulous food but the artisans you visited and got to speak with and the chefs who prepared food for you in such stunning settings is beyond belief. What incredible culinary adventures you guys put together! Kudos!